Good Evening. I am excited to talk about the Anthony N Sabga Caribbean Awards for Excellence, and to provide a report card of building out and sustaining the Solar water heating industry. 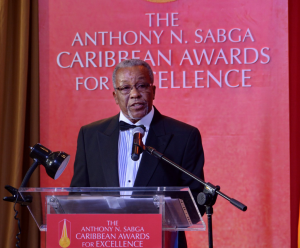 The Anthony N Sabga Caribbean Awards for Excellence is the region’s greatest private sector contribution to the acknowledgement of effort of Caribbean people, in Arts & Letters, Entrepreneurship, Public & Civic Contribution, and Science and Technology. We thank the founding father the late Dr. Anthony Sabga for his vision, foresight and financing of this inspirational programme. Dr Sabga’s story of determination and continuous development, is an inspiration to all of us. I believe that at many levels we share his view that “all things are possible”. We thank the Country Selection Committees for their dedicated work. We thank the group of Eminent Persons who tirelessly make the final selection process. This is indeed a labour of love from our dedicated and noble team. The distinguishing difference of the Anthony N Sabga Caribbean Awards for Excellence is that prize money is given to the Laureates to help them fulfill their dreams. That is a huge differentiator. Taking your work forward requires resources. Usually money helps! Thanks to the Anthony N Sabga Caribbean Awards for Excellence, its Laureates will have some money for their projects or for new ideas. This evening we are here to celebrate the achievements of our 2019 Laureates, to bask in their success, and to encourage them on their way to dreaming bigger dreams, and achieving greater success. This year we salute winners in: Entrepreneurship Ms. Kimala Bennett; Arts and Letters Ms. Danielle Diefenthaller, Science and Technology Professor Michael Taylor and Public and Civic Contributions Mr. Corey Lane. 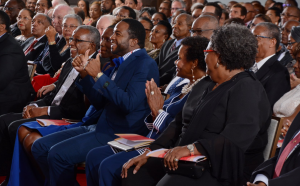 I thank the Barbados Selection Committee, and the Eminent Persons Committee for selecting Corey Lane; the youngest Laureate as Barbados and the region’s winner for Public and Civic Contribution. Corey is an exceptional person whose passion for “At risk youth” has become a blessing to many families and to the society of Barbados. Corey’s program is one, in which there is need of repetition across our region. Perhaps even helping the “At Risk not so young” and “At Risk entrepreneurs”. This evening we will learn more about the work of Professor Michael Taylor on Climate Change. Climate Change is the uninvited elephant in the room. We look forward to hearing more about Climate Change from our 2019 Laureate in Science and Technology, Professor Michael Taylor. We say a big thank you to The Sabga family. nd Civic Contribution, Entrepreneurship, Science and Technology. The Ansa Mc Cal’s contribution of this programme is known to some, but not known “well enough” across the region. I urge the Group to place this program on a high candle stick for all to see. I express heartfelt thanks that I was selected as the Anscafe Laureate in Science and Technology 2008. It has provided me with recognition regionally and internationally. At a personal level, the award made me feel empowered to achieve greater heights, and to continue our journey to make our product the best in the hemisphere, and one of the best in the World. I have felt it a duty to bring recognition to my country Barbados and the Caribbean for Solar water heating to be at the center of excellence in solar thermal technologies. Barbados is now ranked #4 in the World in the penetration of Solar Water Heaters per 1000 populations. Research conducted by United Nations Environmental Programme (UNEP) on solar water heater system performance in the hospitality industry and rated by its users. Turtle Beach Resort in Barbados, whose installation was 17 years; and Bay Gardens Hotel if Saint Lucia, whose installation was 20 years, rated their satisfaction with system performance at 95% to 100% and return on investment at 40% to 45% annually. Many years ago, we had a difficulty in being able to say conclusively, that the contract for our hot water system had been fulfilled. After all, how hot is hot? That is why we invented the Solar Dynamics Temperature Guarantee. It is the first such guarantee on a solar hot water system. The International Energy Agency, the World authority on energy has now converged with us and recently included temperature as a barometer. I am happy to report that in their ratings on system performance, Barbados is #1 in the World at 488.54 Btu per 1,000 populations. We are followed by Cyprus at 398.41, Israel at 393.72 Austria at 384.18,and Greece at 286.54. The volatile hurricane systems of 2017 have made us much more aware of our vulnerability. We have introduced the “Storm Secure “roof mounting hardware system to provide robust resistance to hurricanes. These roof mounting systems are made of long life Aluminium Extrusions and will soon be undergoing testing and rating. We believe that we achieved our goal of creating widespread satisfaction of Solar hot water systems in Barbados, and Saint Lucia, and our other markets of Grenada, Antigua, Dominica, St. Kitts, Nevis, and Guyana. Satisfaction with solar water heaters provides consumers with the confidence to invest in other solar technologies such as wind, and photovoltaic solar electricity systems. Very soon, the Caribbean and the rest of the World will be well on the road to enjoying free energy compliments of the sun, wind and ocean tides. We are delighted to be a part of this transformational journey. The Barbados Association of Professional Engineers (BAPE) has noted the outstanding contribution of James Husbands to the engineering profession over the years. Consequently, he was identified by the association’s nomination committee to be inducted as an ‘honorary member of the association. 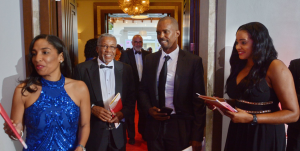 On Dec 1, 2018, James Husbands was made an an Honorary Member of The Barbados Association of Professional Engineers for his work in Solar Thermal systems. Solar Dynamics was the region’s first effort in the response to the 1973 energy crisis and has been a steady contributor to saving energy, promoting environmental sustainability, economic prosperity, and productivity says James Husbands. The company was established in Barbados soon after the 1973 oil crisis, and in Saint Lucia in 1993 with Minvielle and Chastanet Ltd. being the 51% shareholder. 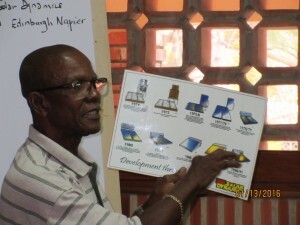 Husbands said that the over 12,000 solar water heaters installed in Saint Lucia each save homeowners 3145 kWh of energy per year, representing a saving this year of $2, 767.60 based on electricity cost of $0.88 per kWh. The solar hot water system each save carbon emission of .042 ton and 1.85 barrels of oil imports. Cumulatively, he said the 12,000 solar hot water systems will this year save Saint Lucia EC $ 37, 740, 000 and 22, 200 barrels of avoided oil imports. Husbands, the longest serving manufacturer and developer of solar hot water systems in the Caribbean has been honoured in his homeland Barbados with a Gold Crown Of Merit Insignia, an Honorary doctorate from The University of The West Indies, a Laureate in The Anthony N Sabga Caribbean Awards for Excellence in Science and Technology and a Pioneer Award from The World Renewable Energy Congress. Husbands provided a comparison of savings using a solar water heater to a storage electric water heater. By comparison, the average Saint Lucian family would save $51.432.43 over a 16 year period by using a solar water heater based on a moderate energy increase every fourth year. Husbands made reference to a United Nations Environmental Programme (UNEP) survey in which Bay Gardens Hotels recorded a 95% to 100% satisfaction rate and a return on investment of 40% per year over the 20 year period in which Solar Dynamics hot water systems was installed at their facilities. In his address, he apologized to customers who were affected during the protracted transition period when Solar Dynamics Barbados sought to take control of its business interest in the Saint Lucia company. He explained that the company has been climbing out of the hole in which it was left. He said that on taking the company over, it was discovered that 90% of its assets had been dissipated during the period of negotiation between 2007 and 2013. On October 1, 2013, he was finally able to take control of the St.Lucia company, acquiring the 51% controlling interest which Minvielle & Chastanet Ltd owned. Congratulating the Saint Lucia Development Bank on its financing initiative, he said that a larger number of families will now be able to avail themselves of the comfort of the solar hot water system. Husbands cited the fact that every morning, families using cold water have difficulty getting the children, and even some adults into the cold shower. This very often results in lateness for school and work and affects national productivity. The solar hot water system was among a group of items selected by the St.Lucia Development Bank which contribute to mitigation efforts to combat climate change. Greenhouse Technology, Awnings and Storm shutters, and solar electrical systems are also being financed through the facility which carries an attractive interest rate of 4.5%, and up to 7 years to repay. Download pdf on Solar Dynamics’ Contribution to Climate Change. For the second year in a row, Solar Dynamics Limited has won the BUILD Magazine’s Award for Best for Solar Water Heating – Caribbean. United Kingdom, 2017– BUILD Magazine has announced winners of the 2017 Sustainable Building Awards. Following on from the success of last years’ awards, the 2017 Sustainable Building Awards celebrate the trailblazers of this dynamic industry. What started out as a niche sector, is now one of the key contributors to the wider construction industry. These awards are designed to recognise the high-level of dedication and skill that has been displayed by the innovative firms and individuals of this remarkable industry. To read more about Solar Dynamics on BUILD please visit http://issuu.com/aiglobalmedia/docs/sustainable_building_awards_2017?e=15629828/53060908 to view the winners supplement and full winners list. James Husbands of Solar Dynamics Limited sat down for a chat with veteran radio announcer/producer from Voice of Barbados’ Dennis Johnson recently. On the agenda: what’s the latest news with Solar Dynamics, how much money can you really save with a solar hot water system and just HOW hot IS hot? Solar Dynamics Ltd has been named: Best for Solar Water Heating – Caribbean in the 2016 Sustainable Building Awards, by Build News. This report provides a starting point for tourism businesses that are interested in exploring the opportunity of SWH. Specifically, this report focuses on SWH opportunities for small to medium sized hotels. The solar water heating system for Turtle Beach was installed in 1997 by Solar Dynamics. In all, the systems measure 251 sq.m., and are designed to serve 100% of the resort’s hot water load. Even with the occasional use of electrical boosters, the resort has reduced its energy bill for heating water by 95%. 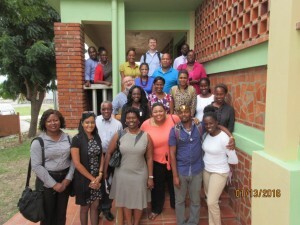 On January 16, 2016 participants in the IDB BRIDGE Project for Capacity Building in ICT and Sustainable Energy in the Caribbean, SEED (Student Entrepreneurial Empowerment Development Project) in Barbados and from the Edinburgh Napier University of the UK, toured Solar Dynamics Limited. The group of 30, which included managers, directors, lecturers and entrepreneurs, heard from past and current managers about the company’s journey and on the successes and challenges of operating in the energy sector over the years. Ivan Franklin, co-developer of the Solar Dynamics Hot Water System, takes the visitors through the development stages of the system from 1973 to the present. 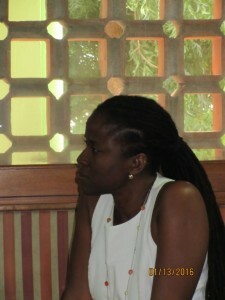 The Head of the UWI SEED program Attorney at Law Mrs Ayanna Young Marshall listens to the presentation of the Solar Dynamics journey. The group listens attentively to Ivan Franklin while Operations Manager of Solar Dynamics Ltd, Mrs Michelle Hickerson (at back) also pays attention. 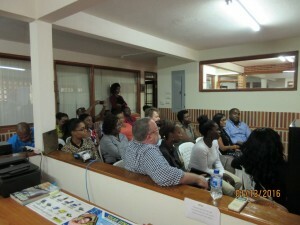 Group from UWI, UTECH, EDINBURGH-NAPIER, visit Solar Dynamics Ltd.
AlJazeera interviewed James Husbands for a TV programme titled EarthRise – Barbados Goes Green in September 2014.